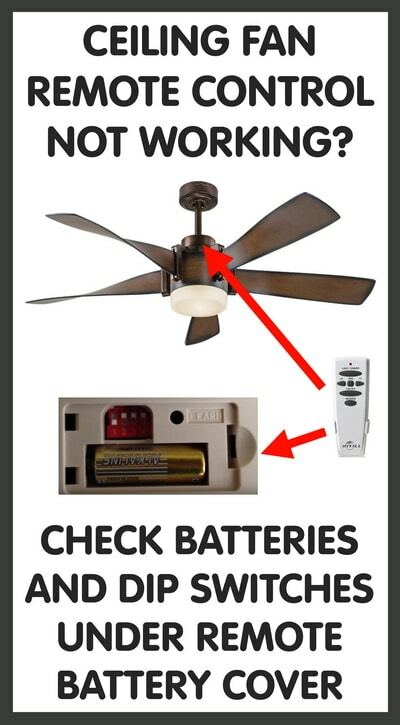 If your ceiling fan remote control does not work, try changing out the batteries. 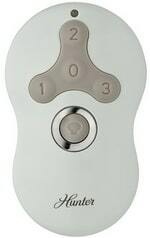 If you lost your ceiling fan remote or it is broken you will need to get a replacement remote. 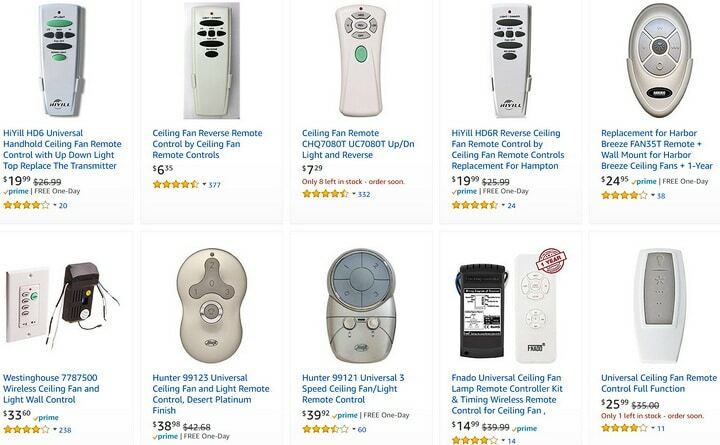 Below are Universal ceiling fan remote controls and name brand ceiling fan remotes made for Hunter, Hampton Bay, and Harbor Breeze fans. NOTE: If your ceiling fan remote does not work and you have replaced the batteries, check that the switch on the wall is turned ON as many ceiling fans are wired to 1 or 2 ON/OFF wall switches. Most ceiling fan remote controls have small switches called dip switches. These switches are located under the battery cover on the remote control and also located on the receiver (depending on the age of fan as some fans do not have a typical receiver). The receiver is located in the top portion of the fan itself. If you have accidentally changed or moved the dip switches on the remote control, the remote will not work and therefore not be able to control the fan to spin or turn on the lights. Here is a way to get the dip switches in the right position so the remote control can work properly with your ceiling fan. If your ceiling fan remote control has 4 dip switches you will need to adjust the switches one by one. It will take 16 combinations to test each setting to try to reactivate your ceiling fan. 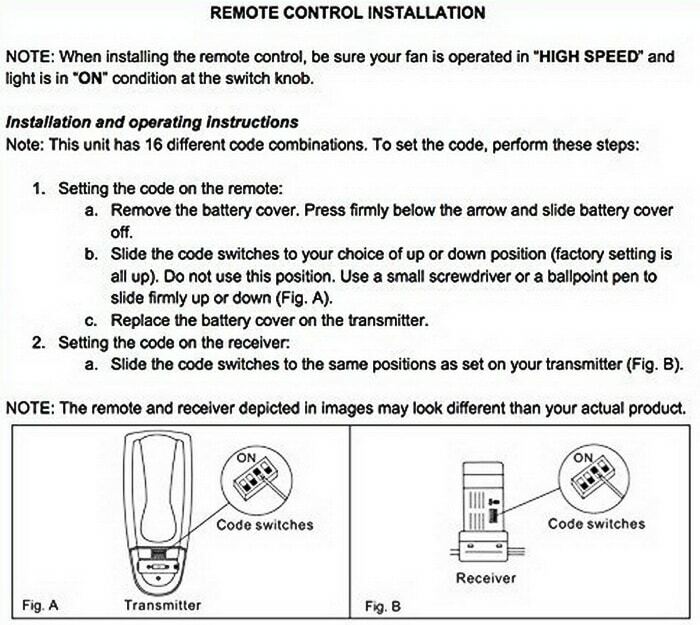 See below for how to set the dip switches on your remote control. -Locate the dip switches under the small panel on your remote control. -Put all dip switches to off or indicated by 0000. -Test it on the fan to see if it works with the fan. -Slide the first switch in the on position or to 0001. -Test this with the fan and see if this works. -Keep testing the different dip switch positions until the ceiling fan works with the remote control. -Try using 0010, 0011, 0100, 0101, 0110, 0111, 1000, 1001, 1010, 1011, 1100, 1101, 1110, and 1111. -Once the dip switches are in the right position, the ceiling fan will respond to the remote. -If you still have trouble setting the dip switches on the remote, check the receiver in the ceiling fan. -Be sure to use caution and turn power off to the ceiling fan when checking the ceiling fan remote receiver. -Once you match up the dip switches with the remote and ceiling fan receiver, the remote should work and control the fan. -If not you most likely have a faulty remote control or bad receiver in the ceiling fan and you will need to replace either the remote control or receiver. -Check wires in fan going to the receiver to be sure all wiring is connected and secure. Put the latest technology to work for you with our SIMPLEconnect app, available for iOS and Android devices. Download the app for free and start enjoying the convenience of scheduling your fan and light with your smartphone. Control your ceiling fan from your smartphone. Featuring 3 speed fan controls, full range light kit dimming and timers for fan and light. 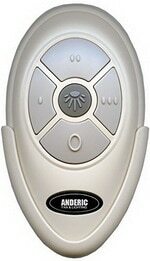 Ceiling Fan Remote uses your device’s Infrared (IR) transmitter to interface with your remote-controlled ceiling fan. This app produces IR signals that have been tested on a small sample of ceiling fans. fanSync allows you to control your ceiling fan from your smartphone by pairing them via bluetooth. For the system to work, you must purchase a remote receiver (BTR9 or BTR9U) that you install in the canopy of most any pull-chain operated ceiling fan. Download the app to your smartphone (iPhone or Android version) and pair to your fan and wallah…you can now control your ceiling fan from your phone. Need help with finding the right remote control for your ceiling fan or getting your remote to work with your ceiling fan? Please leave a comment below and we will be happy to assist you. I would like to add a remote to my ceiling fan for light and fan. I purchased a universal remote kit and the receiver is about 1/8 inch too tall to slide into fan bracket without putting pressure on wires. Does anyone make a kit with a slimline receiver? Previous post: Samsung Dryer TE Error Code – How To Clear?